The Development Economics Vice Presidency (DEC) was established in the May 1987 Bank reorganization as part of the new senior vice presidential complex for policy, planning, and research (SVPPR). One goal of the reorganization was to more closely subordinate research activities to the Bank's strategic agenda and operational requirements. In September 1987, President Conable announced the selection of Stanley Fischer for the position of Vice President, Development Economics and Chief Economist (DECVP). Upon assuming duties, Fischer had multiple responsibilities, the foremost being principal adviser to the Bank President and to the Senior Vice President, Policy, Planning and Research (SVPPR). Initially, only the International Economics Department (IEC), the Country Economics Department (CEC), and the Economic and Statistical Advisers in the DEC Front Office reported to DECVP. By 1988, DECVP's responsibilities were expanded by the transfer from the Front Office of PRESV [Senior Vice President, Policy, Planning and External Affairs] to the DEC Front Office of the Economic Development Institute (EDI), the Director of The World Development Report (WDR), the Research Administrator (RA) and his Research Advisory Staff (RAD), and the editors of The World Bank Economic Review and The World Bank Research Observer. DECVP also chaired several boards, committees, and other panels including the EDI Advisory Board, the Research and Publications Policy Council, the Social and Economic Statistics Committee, the Planning Assumptions Committee, and the Advisory Committee on Economist Training. DECVP was also ex-officio Chairman of the Research Projects Approval Committee (REPAC) which had responsibility for administering the Bank's Research Support Budget (RSB). A permanent Research Committee, also chaired by DECVP, was introduced in January 1988 to establish overall research priorities and to evaluate and make recommendations on individual research proposals submitted for funding from the RSB. The Research Administrator, who headed the Research Administration Unit (RAD), was Deputy Chairman of the Research Committee and REPAC. By 1993, RAD's responsibilities, in addition to administering the RSB, included: managing and editing The World Bank Research Observer and The World Bank Economic Review; administering, producing, and disseminating the Working Papers Series, the Research Abstracts, the Development Briefs, and the Bulletin, and managing the Annual Bank Conference on Development Economics (ABCDE) which was also fundedby RSB. Fischer was succeeded as DECVP by Lawrence H. Summers who reported to the Bank on January 14, 1991. 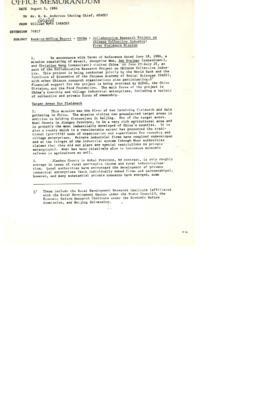 By 1991, the DEC Front Office included a Program Coordinator for Administration. Lewis Preston, who assumed the Bank Presidency in 1991, terminated the Senior Vice Presidencies which resulted in the reassignment of the Geneva Office from the SVPPR Front Office to the DEC Front Office. The Economic Advisory Staff (EAS) was also transferred from the SVPPR Front Office to become the Development Policy Group (DPG) under DEC. The Geneva Office was closed on 30 June 1993 and DPG was merged with the DEC Front Office in November 1993. After the termination of SVPPR, DECVP reported to Managing Director Attila Karaosmanoglu in the President's Office (EXT). Lawrence Summers left the Bank in January 1993 and Michael Bruno became DECVP effective September 1, 1993. The duties of the DEC Front Office under Bruno included providing research support and policy advice to DECVP, managing review functions within DEC, and coordinating the DEC work program, budget, and other administrative services. In a December 7, 1995 Announcement to Staff on the Restructuring of the Bank's Top Management, Bruno's position as DECVP was elevated to Senior Vice President, Development Economics and Chief Economist and was made part of the President's new Executive Committee effective January 1, 1996. A Bank announcement of April 30, 1996 indicated that Michael Bruno had informed President Wolfensohn of his intention to leave the Bank bySeptember 1, 1996. On December 11, 1996, President Wolfensohn announced that Joseph Stiglitz would succeed Michael Bruno as Senior Vice President, Development Economics and Chief Economist (DECVP) effective February 1, 1997. As a result of further Bank reorganizations, by January 1998 DEC consisted of the Research Data and Prospects Group and EDI (which later became known as the World Bank Institute). Nicholas Stern succeeded Joseph Stiglitz as DECVP in July 2000 and filled the position until September 28, 2003. By 2000, the majority of research funding came from the department budget of DEC's Research Group. The Research Committee membership included Regional Chief Economists and managers of the Networks, IFC [International Finance Corporation], World Bank Institute, and the Operations Evaluation Department. Their primary responsibility was to advise DEC on the allocation of the Bankwide RSB. The Committee was to normally consider research projects with planned completion dates within three years. The Policy and Review Department (PRD), which was established on July 1, 1990 and reported to the Senior Vice President, Policy, Research and External Affairs (PRESV), was formed as part of the fine tuning of the 1987 Reorganization. PRD replaced the Strategic Planning and Review Department (SPR) after the International Economic Division had been transferred from SPR to the International Economic Relations Division (EXTIE) in the External Relations Department (EXT) and the policy analysis and review function had been expanded and assigned to PRD. PRD was responsible for: 1) coordinating and managing the policy formulation process in the PRE complex; 2) maintaining a systematic strategic planning process; 3) managing the Bank's work in support of the Development Committee; and 4) providing support to the Secretary of the Policy Committee. In addition, the Department provided support to PRESV on PRE-wide matters, including the PRE policy agenda, work program, and budget. Paul Isenman served as PRD Director during the entire period of its existence. The Department had one division, the Review and Analysis Division (PRDRA) and two units: the Policy Development Unit (PRDPD) and the Program Management Unit (PRDPM). The Review and Analysis Division (PRDRA): 1) coordinated PRE's ex ante review of adjustment lending, Country Strategy Papers, Policy Framework Papers, and other policy issues coming before the President's Council, the Operations Committee and other Bank-wide Committees (e.g., the Finance Policy Committee) as appropriate; 2) carried out, with Operations, the annual lending allocations review; 3) provided a focal point for PRE work on poverty; and 4) managed PRE's development effectiveness work. The responsibility for development effectiveness work was new to PRDRA (prior to July 1, 1990, it was the responsibility of Sector Policy and Research), but the other responsibilities were inherited from the Policy Analysis and Review Division (SPRPA) of the Strategic Planning and Review Department (SPR). The Policy Development Unit (PRDPD), headed by Geoffrey B. Lamb, had responsibility for: coordinating and assisting in the development of PRE's agenda of policy work; serving as secretariat for the PRE Committee; and monitoring PRE work on selected issues which cut across departmental and sectoral responsibilities. The Program Management Unit (PRDPM) coordinated for all PRE units work program and budget preparation, Apex reports, and mid-year and retrospective reviews. PRDPM also administered the Management Information System (MIS) and Office Technology (OT) plan for all PRE units. The Policy and Review Department was abolished on November 30, 1991, as part of a reorganization of the senior management structure which eliminated all the Senior Vice Presidencies and distributed their functions to three Managing Directors in the Executive Office (EXC). Thereview functions of PRD and the Economic Advisory Staff (EAS) were merged in DEC as the newly established Development Policy Group (DPG). The Economic Advisory Staff (EAS) succeeded the Country Policy Department (CPD) of the Operations Policy Vice President (OPSVP) in May 1987. CPD had served as the principal unit in charge of improving country and economic sector work in Bank operations from 1982 to 1987. The Bank-wide reorganization and termination of the OPSVP in 1987, however,prompted the transfer of functions and staff to EAS. The Economic Advisory Staff (EAS) was established in May 1987 and placed directly subordinate to the Senior Vice President, Operations (OPNSV). EAS furnished economic advice to OPNSV. EAS's prime mission was to assist OPNSV in the approval process of Country Strategy Papers (CSPs) and adjustment loans. 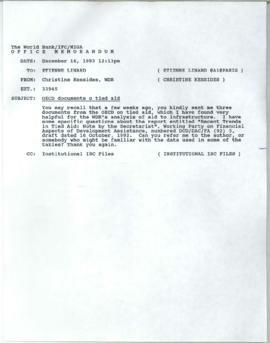 Specifically, ERS was responsible for: 1) advising the Senior Vice President of Operations on economic matters to be reviewed by the Policy Committeeor approved by the Senior Vice President; 2) serving as the Secretariat for the Operations Committee (later called the Loan Committee) and organizing the review by the Operations Committee of policy papers, country strategy papers, and adjustment operations; 3) maintaining the Bank's coordination with other international institutions such as the International Monetary Fund (IMF), the Paris Club, the Berne Union and OECD Export Credit Group; and 4) representing the Operations Complex on the Social and Economic Statistics Committee. Throughout its existence, EAS had no subordinate units. Its Director (Vinod Dubey, June 1, 1987 to July 30, 1990; Enzo R. Grilli, August 1, 1990 to November 30, 1991) was assisted by a Senior Adviser (Fred David Levy) and a Chief Economist (Enzo Grilli until July 31, 1990). After Grilli was appointed Director, the Chief Economist position was abolished. In spring 1991, a second Senior Adviser, Anandarup Roy, was added to the staff. On December 1, 1991, with the terminationof the Operations Senior Vice Presidency, the ERS staff and functions were transferred to the Development Economics Vice Presidency (DEC) as the Development Policy Group (DPG). The Development Policy Group (DPG) was established as part of the restructuring following the appointment of President Lewis Preston when the Senior Vice Presidencies were terminated and the functions located in their Front Offices were assigned to a vice presidency. On December 1, 1991, the Economic Advisory Staff (EAS) which had reported directly to the Senior Vice President, Operations (OPNSV), was transferred to the Development Economics Vice Presidency (DEC) and renamed the Development Policy Group. DPG continued the main duties of EAS: monitoring and reviewing adjustment operations and country strategies. The DPG staff reviewed all adjustment operations prior to consideration by the Loan Committee and before they were sent to the Board for approval. The staff reviewed country strategies (CSPs) whilethey were being formulated at the regional level and prior to reaching the Policy Review Committee. In addition, DPG had a leadership role in determining country performance rankings for IDA allocations and was responsible for advising the Vice President and Chief Economist on Bank policies and procedures and on coordination with the International Monetary Fund, the Berne Union, the Paris Club, and other international institutions. DPG began as a separate unit in DEC but was absorbed into the DEC Front Office in November 1993. Throughout its existence, DPG had no subordinate units. Its directors were: Enzo Grilli, December 1, 1991 to December 31, 1992; Anadarup Ray, acting from January 1, 1993 to October 31, 1993; and Mark Baird, November 1, 1993 to June 30, 1997. The Director was assisted by one senior adviser and by one or more economic advisers. DPG was abolished in the reorganization of DEC which went into effect on July 1, 1997. The International Economics Department (IEC), established as part of the 1987 Reorganization of President Conable, absorbed the functions of the former Economic Analysis and Projections Department (EPD) of the Economics and Research Vice Presidency (ERS). IEC focused on global policy issues and trends in the world economy, supported and generated national and international data for research and Bank operations, and carried out research on international finance and trade issues. More specifically, IEC had responsibility for: analyzing global trade issues in manufactures and services; maintaining and analyzing data on external debt and capital flows; advising on policy options concerning foreign borrowing and debt management; researching and maintaining data on primary commodity markets; preparing market forecasts and advising on policy options regarding Bank lending for commodities; formulating an overview of the global economic situation and promoting consensus on it throughout the Bank through Long-Term and Short-Term Outlook papers and other reports; building tools for model-based global forecasting and doing problem-focused research; managing the Bank's Social and Economic Database (BESD); developing computing systems for socio-economic data management, analysis, modeling and reporting; providing statistical services to the Bank and to developing countries; and directing the preparation of such publications as the World Bank Atlas, the World Development Indicators, the World Debt Tables, and Global Economic Prospects (GEP). IEC was terminated in the July 1997 reorganization of DEC. The Country Economics Department (CEC) was established in May 1987 as part of a general Bank reorganization and was placed in the new Development Economics Vice Presidency (DEC). The CEC incorporated functions of the former Development Research Department (DRD), the Economic Analysis and Projections Department (EAP) and the Country Policy Department (CPD). CEC was responsible for providing leadership in the design and analysis of country development policies through research policy work, operation advice and support, and training and liaison with outside research groups. It did so in specified issue areas, among them: 1) trade policy; 2) macroeconomic adjustment and its relationship to economic growth and poverty alleviation; 3) public economics with regard to resource mobilization, pricing, taxation and subsidies; 4) public sector management and private sector development, focusing on institutional reform of government and state enterprises, and the conditions for private sector development; and 5) financial policy and systems, including financial sector lending, regulation, supervision and restructuring. At the time of its establishment in 1987, the CEC had the following divisions: the Trade Policy Division (CECTP); the Debt and Macroeconomic Adjustment Division (CECDA, later the Macroeconomic Adjustment and Growth Division [CECMG]); the Public Economics Division (CECPE); the Financial Policy and Systems Division (CECFP); the Public Sector Management and Private Sector Development Division (CECPS); and the Special Studies Division (CECSS). On 1 January, 1990 a Socialist Economy Reform Unit (CECSE) was established. In July 1992, the CECSE and the CECMG were merged into the new Transition and Macro-Adjustment Division (CECTM). In the January 1993 Bank reorganization, two of CEC's divisions (Public Sector Management and Private Sector Development [CECPS] and Financial Policy and Systems [CECFP]) were transferred, respectively, to the Private Sector Department (PSD) and the Financial Sector Development Department (FSD) in the Finance and Private Sector Development Vice Presidency (FPD). The remaining CEC divisions, along with research positions from the terminated Sector and Operations Policy Vice Presidency (OSP), were reorganized to form the principal research arm of the Bank, the Policy Research Department (PRD). These developments effectively consolidated all research functions of the Bank under the Vice President, Development Economics (DEC). The PRD Department had the mandate to engage in research on the full range of macro and microeconomic issues underpinning the Bank's country assistance strategies and operations. To that end, it was assigned responsibility for: 1) providing operational support through direct input on issues needing research; 2) producing major, crosscutting research studies; 3) testing and disseminating state-of-the art analytical approaches in an operational context; and 4) providing operational and country-based experience to staff. The following new divisions were announced as part of PRD as of February 1, 1993: Trade Policy (PRDTP, formerly CECTP); Transition and Macro-Adjustment (PRDTM, formerly CECTM); Poverty and Human Resources (PRDPH, formerly CECPH), Public Economics (PRDPE, formerly CECPE); Finance and Private Sector Development (PRDFD, formerly CECFD); and Environment, Infrastructure and Agriculture (PRDEI, formerly CECEI). PRD ended with the reorganization of DEC which went into effect on July 1, 1997. The Development Research Group (DECRG) was established in the Bank reorganization which took effect on July 1, 1997. It replaced the former Policy Research Department. The creation of DPG was in part the result of new organizational changes within the Bank, particularly the creation of networks. Policy research was consolidated under one DEC Group, DECRG, and researchers in the International Economics Department (mainly in the trade area) were reassigned to DECRG. The five former PRD divisions were abolished and their budgets were centralized and replaced by multi-year task-based budgets, with task managers held responsible for delivering products within the budgets. Tasks included cross-cutting issues such as aid effectiveness, industrial pollution, and growth and the environment. Six new Research Managers were recruited, some of which were designated network research coordinators. The new DECRG Director and the new Research Managers formed the management team for DECRG. Sub-fonds consists of the records of the Office of the Vice President, Development Economics (DECVP) and Chief Economist and the Senior Vice President, Development Economics and Chief Economist. These records take the form of Vice President's chronological and subject files as well as briefing books and travel documents. 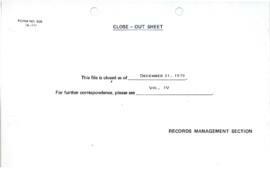 Records of DEC's Front Office staff included in this sub-fonds include reading files, work program and budget records, and reports of periodic review. 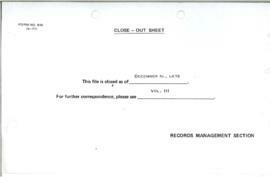 Records of numerous DEC units are also included in this sub-fonds. They include: the Policy and Review Department (PRD); Development Policy Group (DPG, and its predecessor units: the Economic Advisory Staff [EAS] and the Country Policy Department [CPD]); the International Economics Department (IEC); the Country Economics Department (CEC); the Development Research Group (DECRG); the Policy Review Department (PRD); the Research Advisory Staff (RAD); and the Economic Developing Institute (EDI). The records of noted economist Bela Balassa who served as a consultant with DEC and predecessor organizations from 1966 to 1991 are also included. WB IBRD/IDA DEC-03-07 briefing books, Travel Documents, and Travel-Related Correspondence of Nicholas H.
See Records of Individual Staff Members -- Vinod Dubey files (WB IBRD/IDA STAFF-14) and Records of Individual Staff Members - Johannes F. Linn ("WB IBRD/IDA STAFF-29:https://archivesholdings.worldbank.org/johannes-f-linn-files). See the following oral histories: Nicholas Stern; Jean Baneth; Dennis N. de Tray; Geoffrey Lamb; and "Johannes F. Linn": http://oralhistory.worldbank.org/person/linn-johannes-f.
See Records of the Office of the Historian -- World Bank History Project -- Interviews ("WB IBRD/IDA HIST-01-10": https://archivesholdings.worldbank.org/interviews-2) for notes of an interview and interview with Vinod Dubey; notes of an interview with Stanley Fisher; notes of an interview and interview with Nancy Birdsall; interview with Lyn Squire; interview with Wilfried Thalwitz; notes of an interview with D.C. Rao; and interview with Gregory Ingram. 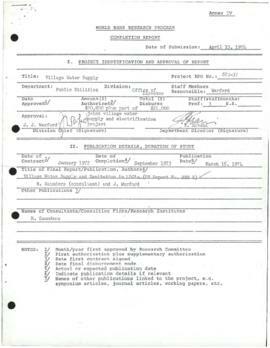 See Records of Individual staff members -- Benjamin B. 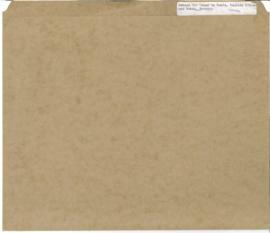 King files (WB IBRD/STAFF-04). See Personal Papers of Hollis B. Chenery (WB IBRD/IDA WB_IBRD/IDA_96).